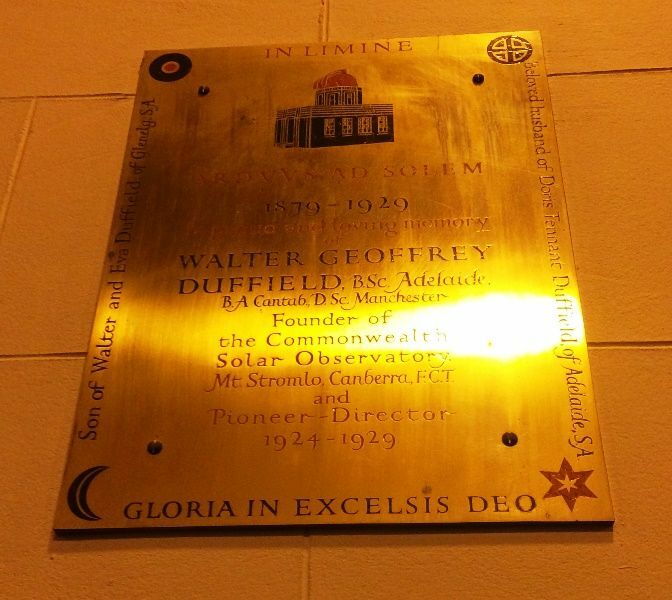 A memorial tablet commemorates astronomer Walter Geoffrey Duffield, founder of the Commonwealth Observatory at Mt. Stromlo who died in 1929. Noting the lack of solar observatories near the longitude of eastern Australia, Duffield promoted the idea of an Australian establishment. In 1908 he became secretary of a committee appointed by the British Association for the Advancement of Science to forward the scheme, and next year visited Australia to pursue contacts with scientists and government. By 1910-11 a site on Mount Stromlo, Australian Capital Territory, had been chosen and a telescope erected for testing local conditions. Duffield inspected the site in 1914 but the war prevented any development. The final decision to proceed was taken in 1923 and Duffield was appointed first director of the Commonwealth Solar Observatory in January 1924. Duffied died in 1929. A memorial tablet to the late Dr. W. G. Duffield, founder and first director of the Commonwealth Observatory at Mt. Stromlo, was unveiled yesterday at St. John's Church, Canberra. Dr. Duffield, a graduate of Adelaide and Cambridge Universities, and a Doctor of Science at Manchester University, was appointed director in 1923. He died of pneumonia six years later, and was buried in the Observatory grounds. The memorial was dedicated by Dr. E. H. Burgmann, Bishop of Canberra and Goulburn. Sir Robert Garran, a friend of Dr. Duffield, delivered the address. The Argus ( Melbourne), 4th January 1954.